News of the Rising started to filter through to the British newspapers on Tuesday April 25th 1916. A smattering of local papers managed to squeeze in the late news that at least 12 lives had already been lost, and that Irish rebels were in control of parts of the city. By the weekend, eyewitnesses had been found and the papers were full of vivid accounts of the unfolding events which sound like something straight out of Rebellion. On the Saturday, the Aberdeen Evening Express announced "Women Assist Rebels – 19 persons killed". 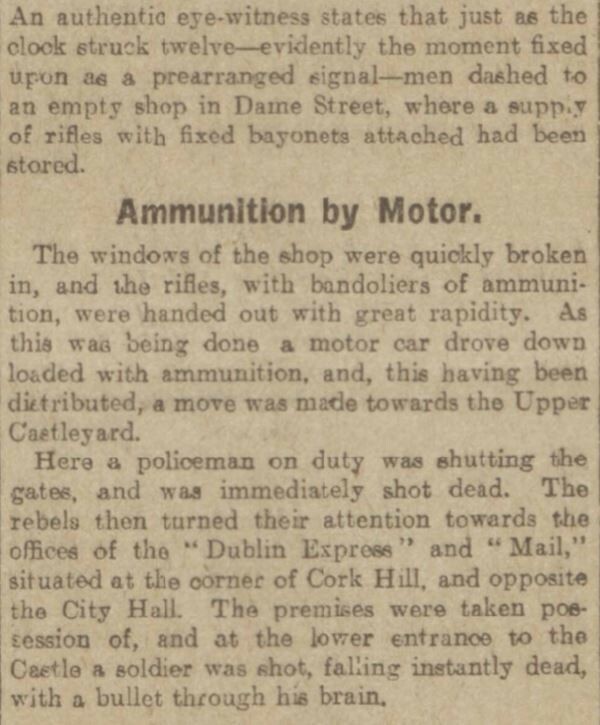 In a piece drawing largely on accounts in the Belfast Telegraph they described the attack on Dublin Castle that formed a pivotal and controversial moment in Rebellion, the shooting dead of an unarmed police officer. Like many other commentators the Aberdeen paper was fascinated by the involvement of women in the fighting. "By this time the rebels had gathered in strong force, and at the side of each man there marched a woman in uniform, carrying bandoliers with a plentiful supply of cartridges." Most of the eye witness accounts, unsurprisingly, came from English people. The Liverpool Echo gathered together as many accounts as they could. One of the fullest came from Herbert Godwin from West Drayton in London who had been in Dublin from Good Friday until the following Wednesday. He described the taking of the GPO and Jacobs Biscuit factory and was obviously quite struck by the imposing Countess Markievicz. 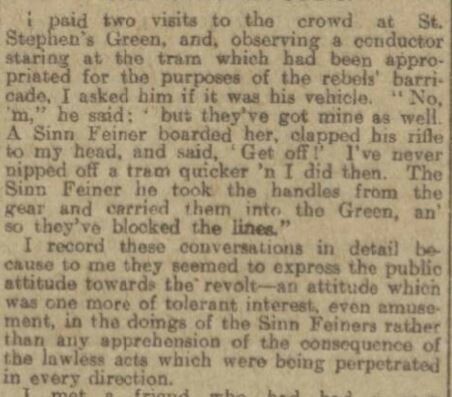 Mr Godwin seemed perplexed by the nonchalant attitude of some of the Dubliners themselves. He quoted a conversation with a tram driver, whose tram had been commandeered to provide more fortifications to the stronghold at Stephen's Green. 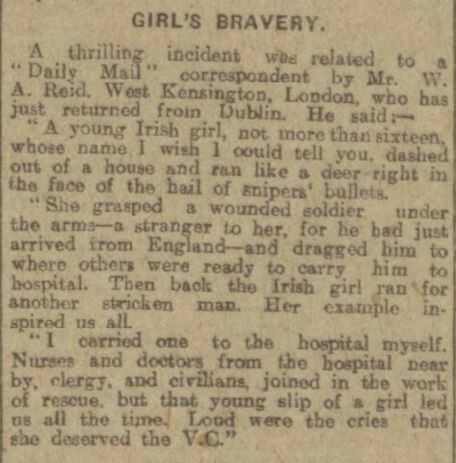 One account that appeared widely in the papers that weekend came from a Mr A. Reid from West Kensington in London who described a young girl's act of bravery. 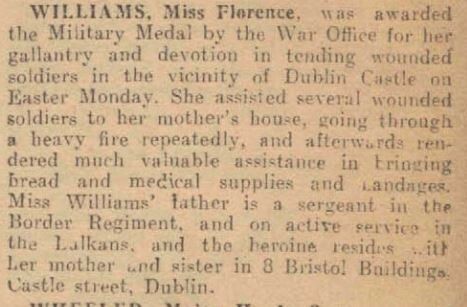 He may well have been referring to Florence Williams, who was awarded a Military Medal for her part in rescuing injured soldiers, according to the Sinn Fein Rebellion Handbook published by the Irish Times the following year – which you can find on Findmypast. 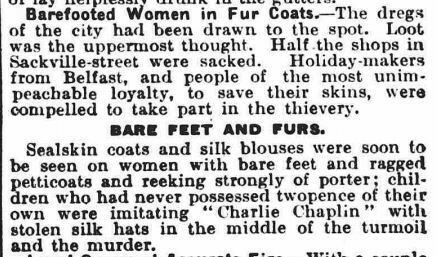 That week the Sunday Mirror described the widespread looting of the city's shops.